Very Very Vicky: Ahhh The Joys Of Remodeling! Coast Awhile Cottage was a bachelor pad for a while before we bought it and turned it back into a family home. And like any bachelor pad there was "the bar"--in fact there was a whole room just for it. This room was located right next to the hot tub room--now a children's bunk room. It's not that the bar looked so bad but I did not want to dedicate a whole room to it--and I especially disliked it being located next to the kids' room. My plan for the room was to make a little den with a TV, DVD player and maybe (if I'm completely out of my mind) a game console. I also wanted to add a laundry area since it seemed to make sense to have a washer and dryer in a 6 bedroom house. Right? The "before" room had some big problems--it smelled terrible. Think rotten eggs. Once we took out the bar we found a sink that was improperly plumbed and the fumes were overwhelming! And there was crazy electrical wiring behind the walls. Think fire trap. Soooo...just like with the rest of the house, there was a lot to do. New electrical wiring, new water heaters, and new venting for the HVAC system were put in to correct old problems. Plumbing was installed properly to repair what was wrong and allow for a laundry room to be put in. We also needed new flooring since the plumber had dug trenches in the floor to complete his job. Finally we came to the end of the heart-breaking "discovery" phase of remodeling--the part where you spend tons of money and feel like you can't see where it has gone...the part where you question your sanity for taking on such a project. 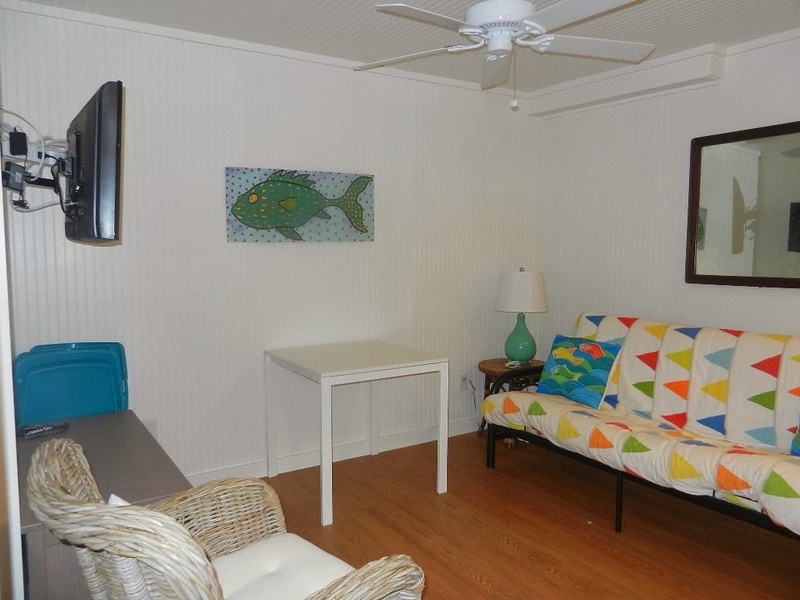 That's when you are glad you have a designer helping you that has been restoring these little old beach cottages for a while to act as the voice of reason. I can't thank Jane Coslick enough--she has talked me off the proverbial ledge a time or two. Ahhh the joys of remodeling! The washing machine and dryer arrived. And all that was left was to furnish this space. Photo courtesy of Jane Coslick ~ The washer and dryer are behind the curtain...folding area to the left. We used the same flag fabric in this room as we used in the adjoining bunk room. I had a comfy futon from home that I brought to allow for additional sleeping space. 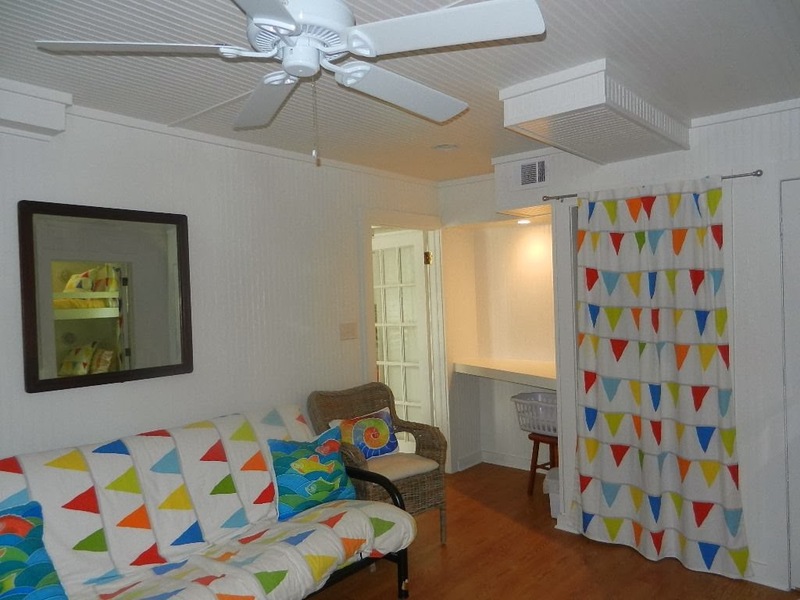 And there you have it--the den at Coast Awhile Cottage. Ahhh the joys of remodeling!